The phrase "keeping the books" refers to maintaining the general ledger, the main accounting record for your business if you use double-entry bookkeeping. It's the primary tool that allows you to keep track of all transactions and sort them into subcategories so you—and your accountant—can find a comprehensive, interlocking record of your business finances all in one place. The general ledger is a complete record of all financial transactions made over the lifetime of your company, not just the last year or the previous month. Why Does Your Business Need a General Ledger? The general ledger serves several functions in the financial operation of your business. Think of it as a catch-all bucket. It holds all the financial information you'll use to create your income statements and balance sheet reports. It's used to prepare financial statements, to research out-of-balance conditions, and for internal and external audits. It includes accounting of assets, liabilities, owners' equity, revenues, and expenses. Lenders will invariably ask for a variety of your financial records if your business applies for a loan. Your general ledger can help you immediately locate and pinpoint whatever information you need. Don't confuse the general ledger with your general journal. The latter is just a chronological record of transactions, while the general ledger is organized by accounts and can display the account balance after each posting. Businesses typically enter much of their financial transaction data into various accounting journals on a daily basis. When a financial transaction occurs and a source document is generated, the transaction is then entered into the general journal. Transactions are listed in chronological order. The date, the amount, the accounts affected, and the direction in which the accounts are affected are all noted. You must make sure that the debits and credits remain in balance when you note each transaction. Your company might also have a wide range of special journals. Some of the more common of these include sales journals, cash receipts journals, and cash disbursements journals. The number and types of special journals a company keeps is a personal decision. These journals are normally generated as you enter your financial transactions into the computer if your company uses a computerized accounting system. The general ledger shows all the summary information for financial transactions for your company from the general journal and these special journals. The general ledger is built by transferring the journal entries of a company's financial transactions from its accounting journals to the general ledger. Each financial transaction has a source document, such as an invoice or a canceled check, as well as a journal entry, normally found in the general journal, your special journals, or both. General ledger accounts are based on the chart of accounts for your small business. This chart shows the main accounts that are shown in your financial statements. Depending on the size and complexity of your business, your chart can consist of hundreds of accounts, including those for current assets, fixed assets, current liabilities, long-term liabilities, owners' equity accounts, sales revenue, expense accounts, gains, and losses. Let's assume you've just opened your doors for business designing websites for other businesses. Your operation requires that you maintain a pretty extensive computer system that sets you back $10,000. 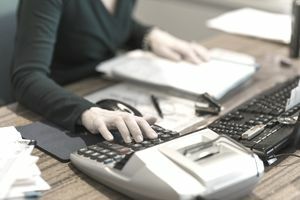 Enter the date of the transaction in the first column on the left of your general ledger and note the journal entry for the computer system in the next column. The third and fourth columns are dedicated to debit amounts and credit amounts. Keep in mind that debit and credit amounts seem counterintuitive on the surface. Assets, which are a plus, have a debit balance so that you would enter the $10,000 value as a debit amount. If you depleted other assets, such as cash, to come up with the $10,000, or if you added liability in the way of a loan to purchase the system, these transactions are credits. You would, therefore, enter the corresponding numbers in the fourth column. Microsoft Business Systems offers a much more comprehensive breakdown for multiple columns to help you track transactions. You are by no means limited to four. Transactions should be entered into their appropriate journals, then summarized and entered into the general ledger once a month. There should be a separate page for each account.